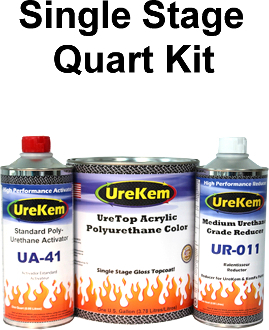 UreTop Pearl Urethane Single Stage Topcoat 1.5 Quart Kits - Buy Custom Paint For Your Automobile Or Motorcycle At Discount Prices! This listing features a kit containing a full QUART of a UreTop Polyurethane Topcoat PEARL color your choice, a HALF PINT of activator and a HALF PINT of reducer. UreTop combines durable urethane polymers and co-reactants with automotive grade pigment to create a line of high gloss urethane single stage colors that are easy to apply with great flow and leveling, and dry to a high gloss, high DOI, finish that lasts. Mixes 4:1:1 by volume. This kit is enough material to paint the average sized motorcycle. Note: Not all of our 400 series pearl colors are available in single stage. 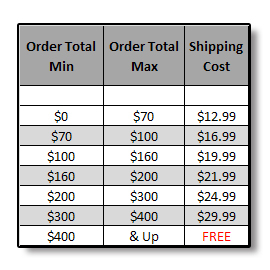 Check the dropdown menu below for color options.